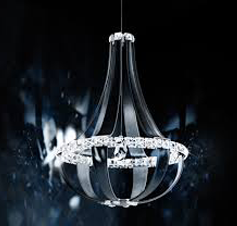 SHIMERA aims to bring a quality range of interior lighting fixtures that suit every client requirement. The extensive assortment of products offered by the company not just enhances the aesthetic appeal of a home but also score high in terms of functionality. 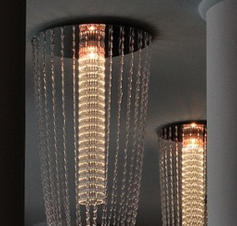 Built from quality materials, the light fixtures made available by SHIMERA meet all industry standards. 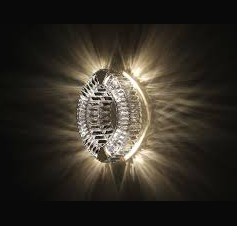 The indoor lighting system at SHIMERA brings for clients a carefully chosen selection of the world's most unique; yet un-discovered light fittings we know will delight. 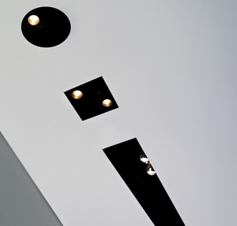 This is an innovative range of professional recessed trimless light fittings created to deliver a high lighting performance, with an eye on energy saving and excellent visual comfort. 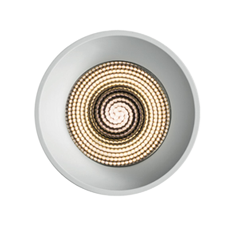 This is an innovative range of professional recessed light fittings with trim created to deliver a high lighting performance, with an eye on energy saving and excellent visual comfort. 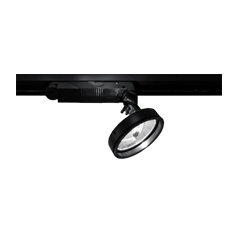 Optic unit with integral adjustable spotlight using high-performing Led. Tilt angle of up to 40°, rotation of up to 355°. 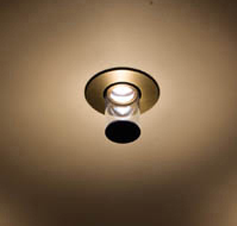 Lamps can be maintained without the need for tools by a simple quarter turn rotation of lampholding ring. A range of recessed downlights (pre-assembled units with optic and ring) using 2x18W and 2x26W compact fluorescent lamps. Body is made from vacuum-metallised technopolymers. 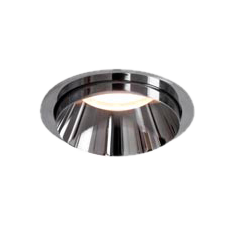 A range of recessed downlights using 1x13W to 2x42W compact fluorescent lamps, a system which provides ample possibilities of combining optics and rings. Body is made from vacuum-metallised technopolymers. Eco-friendly CoB LED with energy saving and low maintenance cost.Different types beam angles reflectors for customer choice in different applications.Good thermal management guarantees long lifespan. 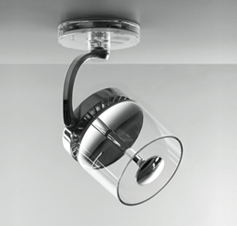 Narrow beam angle wall washer effect on cleaner ceiling design.With transparent glass to protect the CoB chip.355° rotating and 30° tilting.Darklight reflector with 30° cut-off angle create visual comfort. 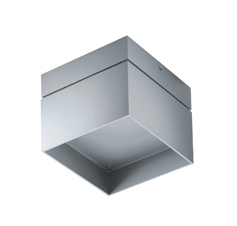 Recessed and fully concealed light fitting, IP20 or IP55 protection rated, designed for ceiling or wall mounting, available in the finishes: my bianco, silver, my nero, brown and polished chrome-plated. 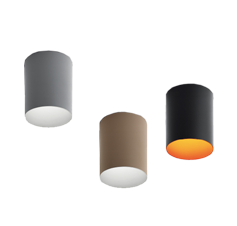 IP20 rated fully concealed lamp for interior use, made of aluminium painted my bianco and my nero. 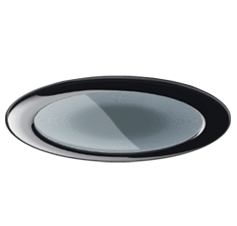 IP20 rated recessed lamp for interior use, made up of a recessed aluminium body onto which a transparent glass element is fastened, 54mm in diameter and 75mm tall. This is a system which integrates with architecture. it defines spaces, volumes and surfaces. 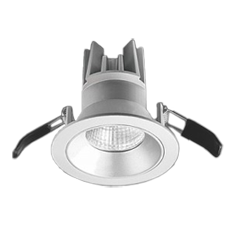 it can be fitted with different light sources: halogen and metal halide lamps, fluorescent lamps to create a continuous light line and systems for emergency lights. 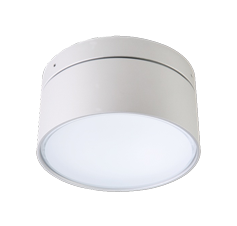 Recessed light fitting for interior use, available in three versions: IP40 fixed recessed light, wired with a PGJ5 20-35W metal halide bulb with my nero finish, excluding power supply unit. 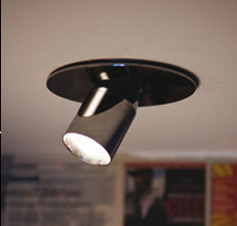 Efficient, clear accent lighting, fixed and adjustable. Diffused ambient lighting (in fixed version). 2 colour temperatures: warm white (3000K) and neutral white (4000K) - CRI=80 (min.). 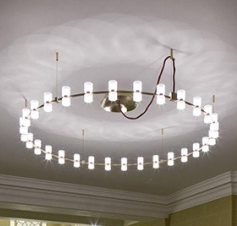 Ceiling light using QR111 12V halogen lamps. Extruded aluminium body with a white paint finish. 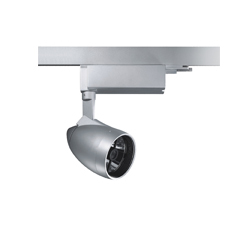 Each spotlight may be adjusted individually with a tilt angle of up to 40° and rotation of up 355°. 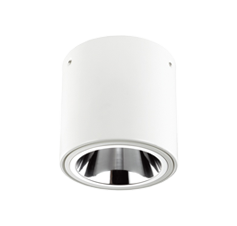 A series of cylindrical luminaires for ceiling-mounted installation, available with different diameters and depths, allowing cluster configurations. 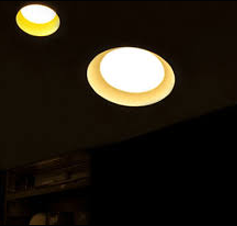 Eco-friendly CoB technology with high energy saving and low maintenance cost.Precise optical design creates smooth light distribution.Optimal thermal management guarantees a long lifespan.No UV radiation. Housing: aluminium, powder-coated. 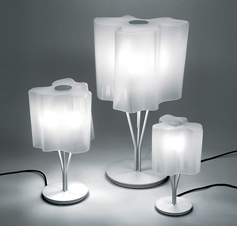 Lampshade: safety glass, printing. Simplified and clean-cut style. 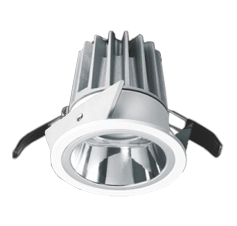 Eco-friendly LED technology along with energy efficiency and free maintenance.No UV or IR radiation in the light beam. Housing: aluminium, powder-coated, anti-dazzle design. 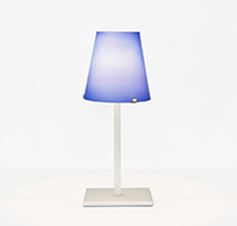 Lampshade: acrylic, matt lacquer, with patent technology, Transmittance efficiency up to 95%. 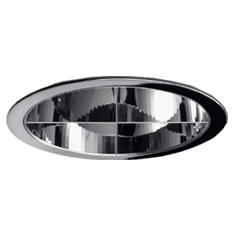 Indoor light fitting for ceilings in polished aluminium or white, grey, black or bronze painted finish, for E26 par 20 or 30 lamps. pl 30 version can be also supplied with wiring for fluorescent lamps or for metal halide lamps (complete with ballast) with G12 socket. 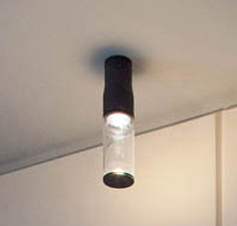 IP20 rated ceiling light fitting for interior use, made of aluminium painted my bianco, nero royal or made in copper bronze brass.it consists of a splayed cylindrical body and a transparent pyrex glass cylindrical element. 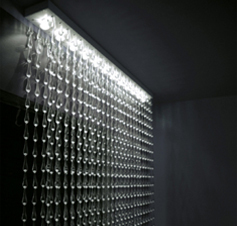 Wall and ceiling lighting fixture suitable for damp locations wired with 1W 3200K/4200K led. it’s available in three different finishing options: oxidized aluminium polished silver, oxidized aluminium mat brushed black and weathered brass. 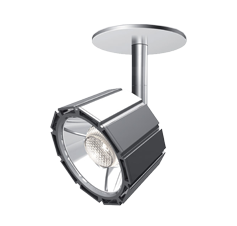 This is an innovative range of LED spotlights with exceptional photometric performance and flexibility. 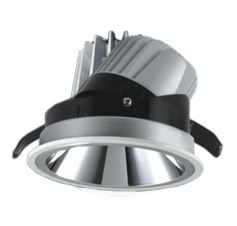 Boasting elevated luminous flux, excellent colour rendering, energy efficiency, and a light compact design. 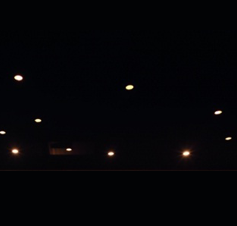 A range of directional spotlights using 12V dichroic halogen, HIPAR51 metal halide and 230-240V LED lamps. 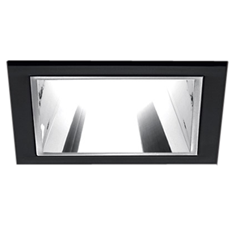 3 options available: with 3-phase track adapter, with base plate or with recessed plate. 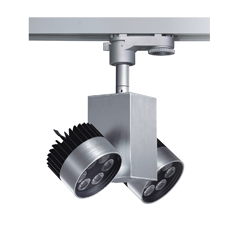 A range of directional spotlights using 12V or 230/240V halogen and metal halide lamps. 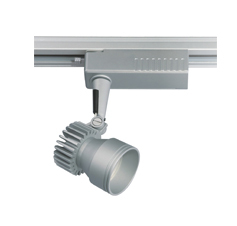 With three-phase track adapter.Aluminium body comprised of an optical and power supply unit. 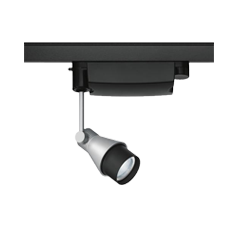 Adjustable projector for 12x1,08W high performing LED. Body made from aluminium and translucent plastic material.Tilt angle of up to 90°, rotation of up to 358°. This is a complete and versatile range, suitable for use in retail spaces, showrooms, museums or art galleries. 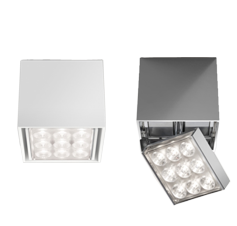 Available in 3 sizes, with different light sources (LED, metal halide, halogen), installation options,designs, colours, optics and a wide range of accessories. 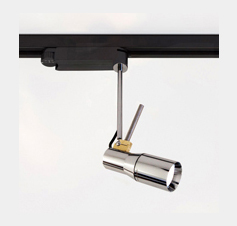 Interchangeable optical unit through a ‘twist & lock’ mechanism. 2 beam angles: 2x3,5°, 2x8°. 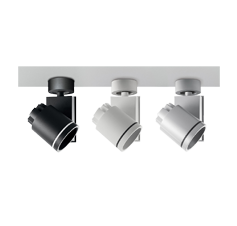 Rotation of 360°, tilt angle of +90°/-90° 2 installation options: with adaptor for 3-circuit track, or base plate for ceiling mounting. Elegant style as engine of aircraft. 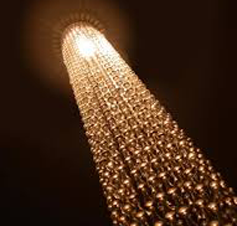 Cover different lamps: metal halide lamps and halogen lamps. 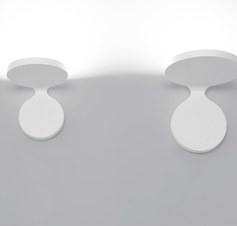 355 rotation and 90 tilt angle to maximize the lighting range. Refined and stylish design. 355 rotation and 180 tilt angle to maximize the lighting range. Precise optical technology and anti-dazzle design create a visual comfort efficiently and high performance. No UV or IR radiation in the light beam. 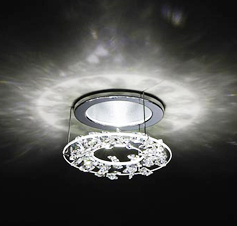 Stylish spotlight design with high luminous efficacy. 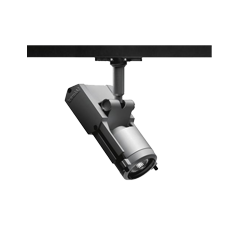 355 rotation and 90 tilt angle to maximize the lighting range.Precise optical design create a smooth light distribution. Anti-dazzle design create a visual comfort efficiently. IP20 rated track lamp for interior use, made of aluminium painted my bianco and my nero. 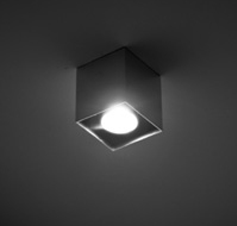 IP20-rated indoor light fitting for tracks and ceiling made of aluminium painted my nero, my bianco. 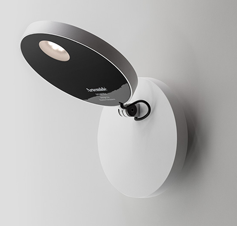 the head Ø80mm of the lamp can rotate by 360° on the vertical axis and by 140° on the horizontal axis. 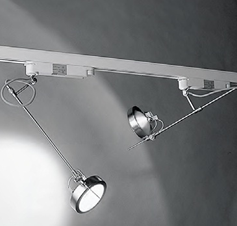 Lighting system for interiors IP20 made up of a spotlight adjustable on three axis, fitted on 230V or 12V track. 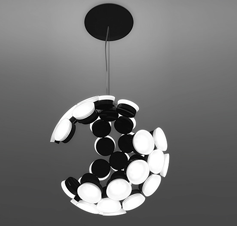 it is available in black or white/silver oxidized aluminium finish. 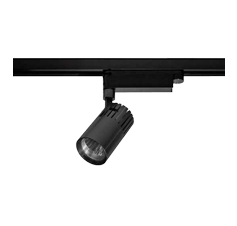 IP20 lighting system for indoor use, made up of a spotlight adjustable on three axis, mounted on a 230V track. it mounts a lamp with GU5,3 50W and GX10 35W connections. 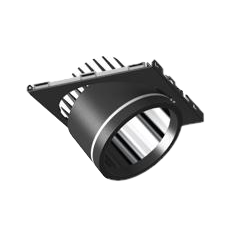 Track fixture for interior use IP20 made of white or grey painted metal, adjustable on the vertical axis from 5° to 85° with 355° rotation. 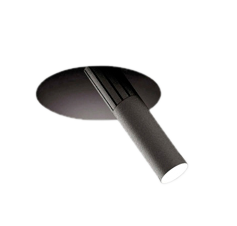 Track spotlight for interiors IP20 with sandblasted brass finish equipped with telescopic arm and adjustable reflector. wired for 12V G53 halogen lamps with aluminium reflector or led AR111. 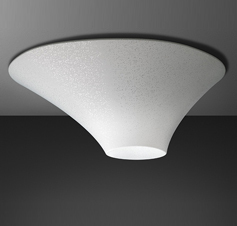 Painted steel structure; opal methacrylate diffuser; white doublestretch fabric cover with texture. 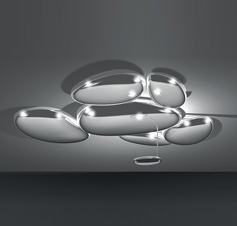 A series of pebbles forms a bright sky reflecting the light that bounces on its biomorphic surfaces. 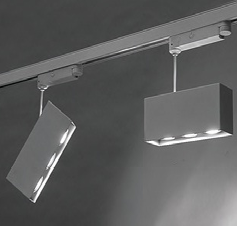 Abs injection-moulded reflective units; lighting unit in die cast aluminium; painted steel bearing structure. Painted aluminium structure. 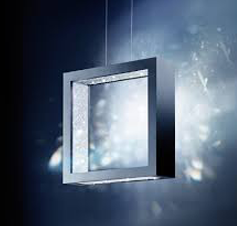 Each Led is fitted with a transparent methacrylate lens and a satin finish methacrylate lens-holder. This is unique both in functionality and aesthetic effect. It can be integrated into the ceiling in a completely new way to become one with the architecture. 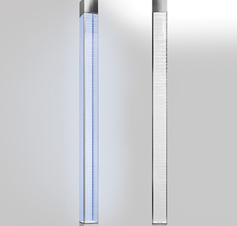 This luminaires combines clear, symmetrical reflections with functionality. 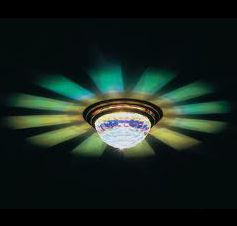 With its precision cutting and excellent light dispersal, this crystal hemisphere is perfect for providing general illumination in bars, restaurants, hallways and hotel suites. 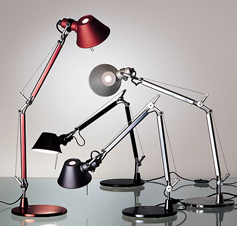 Attraction luminaires, with a HID lamp, are very powerful. 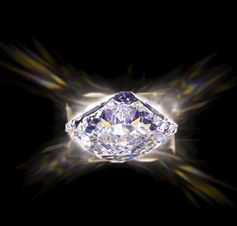 A ring of highly polished crystal, or crystal set into a ring of glass, enlivens ceilings with an atmospheric light show. 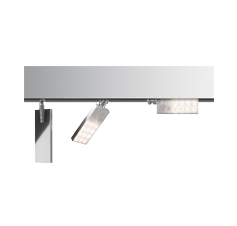 Light fitting for interior use, IP20, made in overlapping sheets of polished or white painted aluminium, with shaped holes to house GX8.5 metal halide lamps, complete with power supply units. 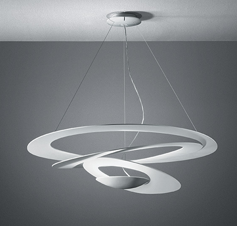 This light fixture for interiors IP20 for ceiling installation. 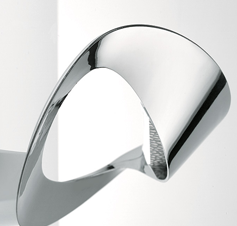 it consists of a circular plate in polished AISI 304 stainless steel, whose diameter is 200mm. 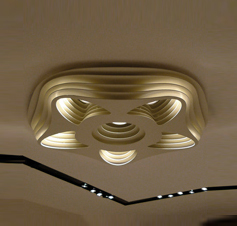 Ceiling lamp with IP40 rating for indoor lighting. made up of a white varnished steel body and extruded aluminium frame that contains the diffuser shaped with irregular curves and white abs anti-glare louvres. 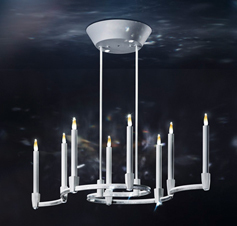 Ceiling light fixture for interiors IP20. it is fitted recessed, being totally integrated within the architecture; it is built in white painted plaster. two versions are available. 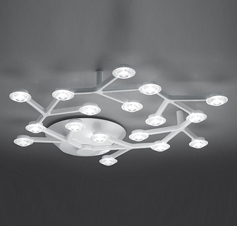 IP20 ceiling modular lighting system for indoor use. 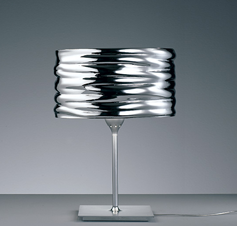 it consists of a 1000x100x30mm extruded aluminum piece, arranged with clamps at both ends to create continuous lines. 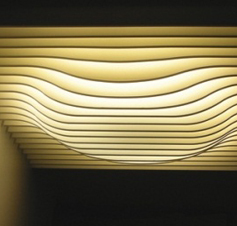 The undulating waves have been studied to capture light from several different sources as a way of creating a very poly-sensorial distribution of light within a room or architectonic space. 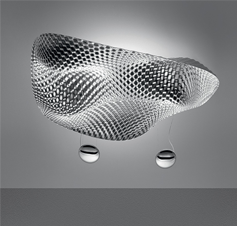 The spherical diffuser design is enhanced by a removable-fitting and tapering luminous stem, that makes a sweet transition from the strong diffuser light to the blind lamp structure area. 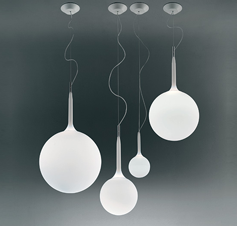 Suspension lamp, coordinated with the wall lamp model. 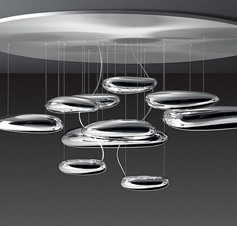 A ceiling fixture that places a floating assembly of large pebbles below a simple modern aluminium disc. These in turn reflect each other bouncing light between their taught bio - morphic surfaces and reflecting the environment around them. Created through the repetition of an elementary module, this suspension lamp consists of a sphere with an incomplete structure. Future unites with past. 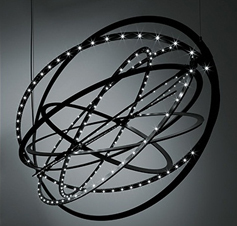 LED crystal candles erupt from curvilinear framework for a defining light formation. Aglow, CANDELLA emits unrestrained intensity. 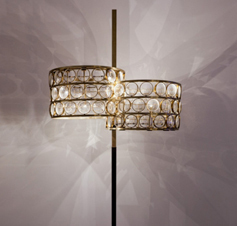 Follows the extravagant approach of turning the classic chandelier structure into its opposite: The crystal becomes the sparkling frame and elegant leather turns into the decorative eye-catcher. plays with contrasts, the styling of which can be individually configured. As the playful reversal of a chandelier’s function, a familiar language of forms made of squares and rectangles only shines subtly to the outside - the true light radiates from the inside. IP20 rating suspension light fitting for indoor use, made with natural brass profiles with a section of 10x10mm and biconcave lenses with a diameter of 64mm that create evocative lighting effects. 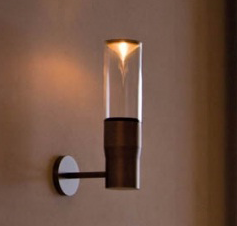 IP20 rated suspension lamp for interior use, made of natural brass profiles with a section of 10x3mm and frosted glass ferrules with a diameter of 60 mm. 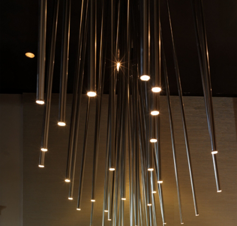 Light fixture for interiors IP20 ceiling installation. 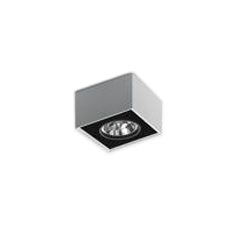 it consists of a circular plate in polished AISI 304 stainless steel, whose diameter is 575mm. it houses a max75W E27 halogen / led lamp for 250V power supply. 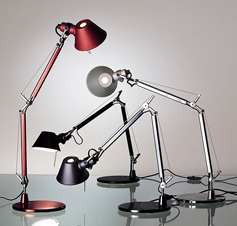 Floor Lamp - Material: body lamp in injection-moulded thermoplastic material; reflector in optic aluminium. 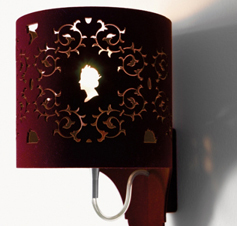 The head of the lamp, obtained through a highly innovative process, has both an aesthetic and a technological function. IP20 rated floor lamp for interior use, made with a double shade with 10x10mm section natural brass curved profiles and biconcave lenses measuring 64mm in diameter that create evocative lighting effects. 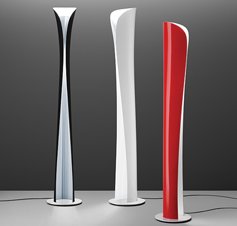 IP20 rated floor lamp for indoor use, consisting of a red or white fibreglass diffuser with an elliptical section of 760x840mm, mounted on an aluminium rod with my nero finish. 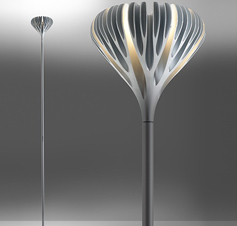 Die-cast aluminium base and structure; steel stem; moulded and mirror-treated aluminium diffuser. 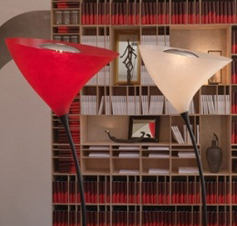 A wide collection of glass lamps, which is divided into three sizes, four types and two finishes. 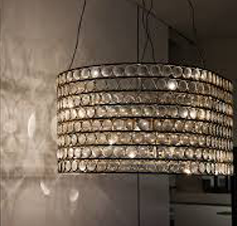 Blown glass, milk glass shade with crystal shades, allows for soft light located either on the floor or on the wall, generating a powerful light. 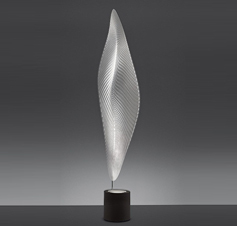 Painted metal structure, blown glass diffuser with polished-silk finish. 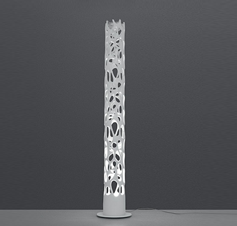 Painted metal stem; white adjustable diffusers in painted perforated plate steel. 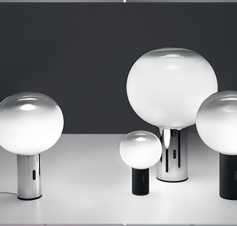 Table lamp for interiors IP20 in opaque silver or brown oxidized aluminium, and hand-blown coloured or transparent glass diffuser. This is supplied complete with E14 40W 250V incandescent, led lamp. 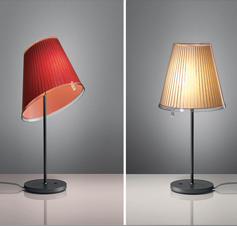 IP20 table lamp for interior use, made of painted steel in different shades of colour matching with power cables covered with cotton. 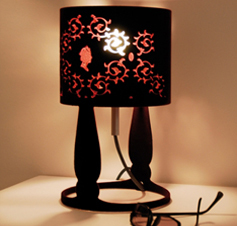 IP20 rated bed/table lamp for interior use, made of metal covered in velvet with a 170mm dia. 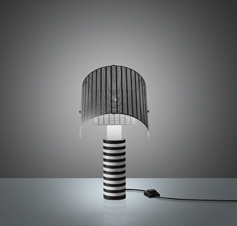 lampshade, available in black, grey and cardinal red. 300mm high, it stands on a 170mm dia. This is a little reflection of itself, a bending splitting amoeba. 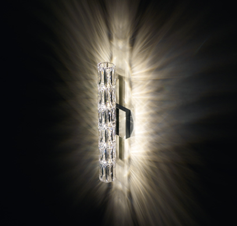 This small wall lamp, available in two sizes (120 and 170mm). 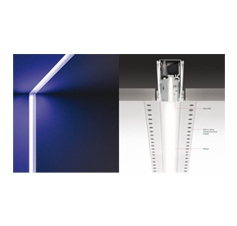 two equal and perpendicular dics act as wall support and host the LED optics, which difuse indirect light with a 90% performance level. 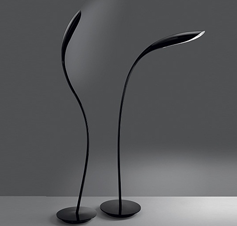 Body lamp in injection-moulded thermoplastic material; reflector in optic aluminium. Base, head and arms in painted aluminium. Adjustable arms and head. 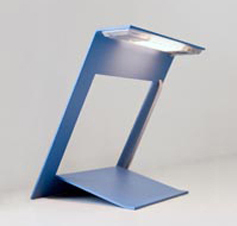 Wall support and body lamp in painted die-cast aluminium. 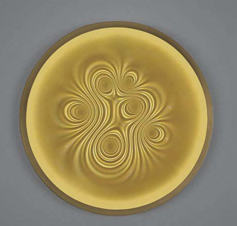 "Generated from advanced parametric scripting the vortices act as light capturing forms, emitting a glowing light phenomena from a ring of LEDs located in its circumference. 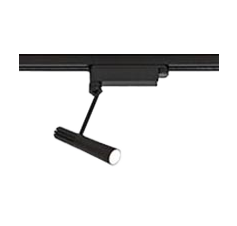 Intended for mounting in either singular or multiple clusters across walls or ceilings ". 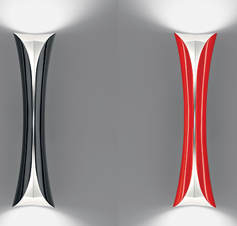 Wall lamp in painted aluminium. 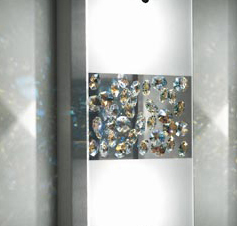 The countless crystal facets reflect the light and create exciting reflections on the wall. Eyris integrates harmonically into the sophisticated architecture of representative rooms in hotels and restaurants. 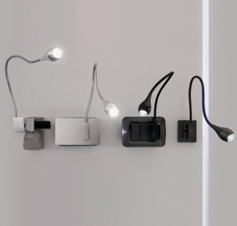 This is a versatile and flexibly applicable luminaire: It is available as a wall and pendant luminaire each in various sizes, the wall luminaire can be mounted horizontally as well as vertically. 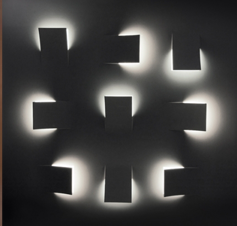 The crystals set in Flair luminaires create brilliant geometrical reflections on the wall. 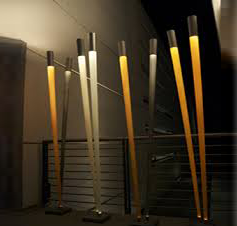 Their pleasant, glare-free illumination is particularly well suited for use in hallways, living rooms and bedrooms in hotels and in homes. 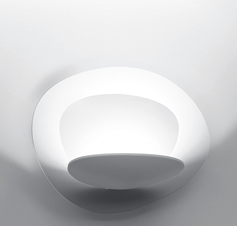 Recessed wall light fixture for interior lighting IP20, consisting of kit with halogen or fluorescent source. the lamp consists in a plaster body . 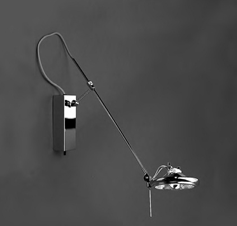 IP20 wall lamp for interior use, made of flocked metal, 250mm high with a 170mm dia. 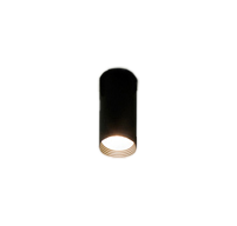 lampshade, or an halfcylindrical lampshade 300mm wide, 260mm high and 150mm deep from the wall.